MARLBORO, Mass.- With four teams in Mid-Wach B (Nashoba, Westborough, Groton-Dunstable, and Marlborough) having at least eight wins, the best way to separate them is to see the results when two of the teams go head-to-head. On Friday night in Marlborough, the Marlborough Panthers (9-2, 4-0 Mid-Wach B) added a 66-48 victory over the Groton-Dunstable Crusaders (8-2, 2-2 Mid-Wach B) to their résumé. In a game where Marlborough led from start to finish, the Panthers were paced by starting guards Joao Mendes and Owen Cappadona. Mendes led all scorers with 22 points, while Cappadona contributed 19 points and 8 rebounds. Mendes and Cappadona said that the two guards work off each other on offense. Marlborough head coach Scott Bauman was happy with the way that Mendes and Cappadona played against the Crusaders. 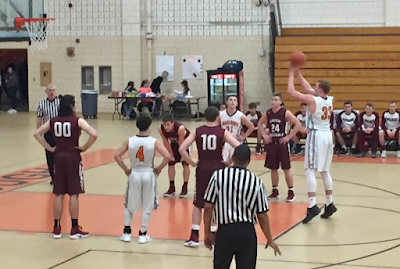 Three-pointers also played an important role for the Panthers on Friday, as Marlborough knocked down ten shots from beyond the arc. Twelve of Mendes’ points came on buckets from beyond the three-point line. Marlborough made two three-pointers in the first quarter, including one at the buzzer that was banked in by Michael Villodas. Villodas’ shot allowed Marlborough to jump out to a 16-6 lead at the end of the first quarter. Baskets from downtown by Ethan Kirsch and Mendes allowed the Panthers to extend their lead to 22-8 with 5:34 remaining in the second quarter. As the second quarter wound down, the Crusaders chipped away at Marlborough’s lead. A couple of baskets by senior captain Gavin Keough cut the Crusader deficit to 27-19 as the first half came to a close. Keough led the Crusaders with 13 points to go along with 6 rebounds and 1 block. Keough opened the scoring in the second half, trimming the Marlborough lead to 27-21, but the Panthers responded with four three-pointers, with Mendes making two triples, Cappadona contributing one, and Connor McCabe accounting for the fourth three-pointer of the third period for Marlborough. The Panthers’ three-point party helped the home team jump out to a 42-27 lead with 2:41 remaining in the third quarter. Groton-Dunstable was not done yet, however. The Crusaders went on a 13-2 run, closing the gap to 46-40 with 6:46 remaining in the fourth period. Coming out of a time-out, Marlborough responded with a 14-3 run of their own, crushing any hopes of a Crusader comeback. Coach Bauman said that his team’s tendency to allow Groton-Dunstable back into the game is a sign that Marlborough still has some work to do before they reach their full potential. “We’re not quite there yet. We’ve still got a lot of growing to do,” Coach Bauman said after the game, emphasizing the fact that the Panthers need to play well for all 32 minutes. When the game got close, the Panthers turned to their 6-foot-8-inch junior Chris Doherty, who got into foul trouble in the first half. Doherty finished with 9 points, 12 rebounds, and 3 blocks, and helped the Panthers lengthen their lead whenever Groton-Dunstable got within a few possessions of the Panthers. Marlborough never trailed against Groton-Dunstable, and seems to have recovered from their losses to Algonquin and Shrewsbury. They played aggressive defense, forcing turnovers throughout the contest, and moved the ball well on offense. The Panthers proved that they can win even with Doherty on the bench, as Mendes and Cappadona displayed leadership by stepping up and making more than enough plays to ground Groton-Dunstable. Marlborough will look to stay undefeated in Mid-Wach B on Tuesday at Westborough, a team that is searching for a statement win over a top Mid-Wach B team like the Panthers. Groton-Dunstable never gave up, but did not have enough offense to keep up with Marlborough. Keough was the only member of the Crusaders who had a double-digit point total against the Panthers. Doherty had a clear advantage against the Crusaders on both sides of the ball, and Marlborough’s ball movement made it hard for Groton-Dunstable to get stops on the defensive end. After losing two of their last three contests, the Crusaders will try to get back on track Monday at Maynard.